As the data center industry grows in geographic breadth and technological sophistication, it is natural that design professionals, owners and operators pay attention to the capital-intensive effort of designing and building a new facility. This phase, however, is a very small portion of the life of a data center. It is intuitive to consider a project’s development in a linear manner: one thing leads to another. In a relatively young industry, when we use terms like design-build-operate, it is easy to slip into a pattern of thinking of Operations as the last group to come to the table when building a data center. In fact, the opposite is true, and it is time to change the way we think about operations. Phrases like “start with the end in mind” may seem like platitudes but speak to the need for broad changes in how we think about—and plan for—data center operations. When launched at the beginning of the design process, an operations-focused approach ensures that the enormous capital investment made in a data center will produce the most efficient returns possible. In order to change this kind of thinking, we can begin with concepts that have broad acceptance and significance in the industry and apply the principles to operations. Whether it is a new build, retrofit, or expansion, all design-build activity is really just a form of change management: a point in time with actions that must be managed to reduce risk and ensure uptime. Furthermore, operations is an overarching continuum that provides consistency once a data center is in production. It provides discipline and rigor with change management procedures. Ultimately, ensuring uptime is the responsibility of Operations; with that responsibility should go the authority and the role of active participant from the very beginning. Organizations that understand this model establish a mindset that Operations is the customer, which changes the communication dynamics and ensures openness and unity of effort. Unfortunately, too many data centers have to make significant changes in their first year after substantial completion. Even if the changes are not as extreme as rebuilding infrastructure, there can be enormous costs—both in terms of rework and ongoing loss of efficiency. Most of these costs could be avoided if Operations is asked to provide critical feedback on facility maintainability during the design phase. This input ensures that the original design considers the long-term costs of maintenance. The Value Engineering (VE) process has its benefits, but it tends to focus just on the first costs of the build. If VE is performed without Operations input, increased costs over the life of the data center may dwarf any initial savings realized from the VE changes. The timeline and key milestones for design-build do not need to change. What does need to change is the understanding of the level of activity required by the Operations group to ensure that production environment risk is minimized. This understanding can only be gained when Operations actively participates in the project from the very beginning. 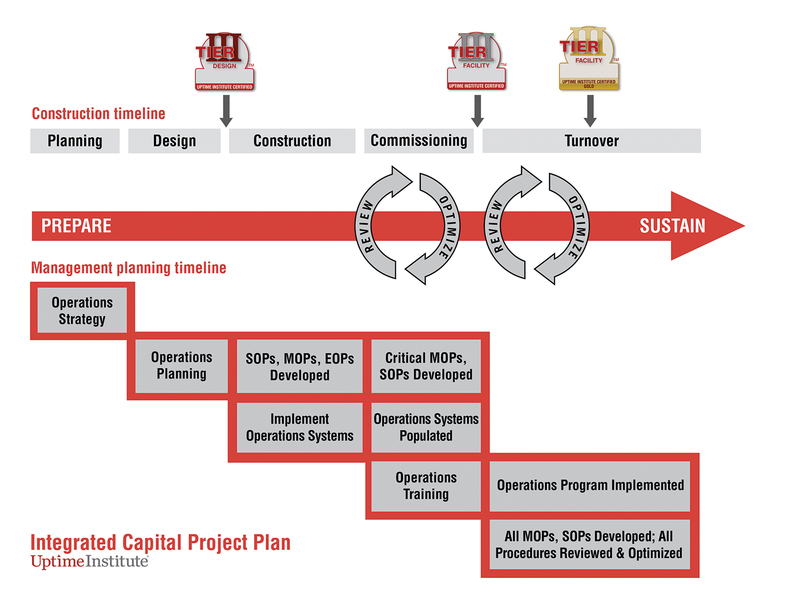 The following roadmap illustrates an optimal approach to the traditional design-build phases, and expands those phases to include the key operations activities that must be accomplished concurrently. The integrated approach will successfully prepare the project and the Operations team for turnover into a production environment. The roadmap provides context and shows the path that will ensure an organization achieves industry standards and experiences the full benefit of consistently implemented industry best practices. This summary also identifies the three key milestones to achieving Uptime Institute Tier Certifications. The scenario: a data center is going to be built. The organization has allocated capital budget and is accepting bids from various entities depending on whether it is a design-bid-build or design-build project. At this point in time, the business requirements are fresh in the minds of the project sponsor and the business units, as they only recently completed the justification exercise to get capital budget approval. Now is the best time to make key decisions on how to operate and maintain the new data center. Key organizational decisions made at this stage will drive subsequent activity and alignment of the design and operations disciplines throughout the rest of the project. Taking a holistic, operations-focused approach from the start will ensure that the large facility investment about to be made will be implemented in a manner that reduces risks and increases return. It is critical to clearly define what success looks like to the Operations group. Their criteria will drive service-level expectations to all stakeholders, and the organization will use associated key performance indicators (KPI) as a quantitative means of assessment. With the key measures defined, it is important to thoughtfully develop a concept of maintenance and operations based on industry best practices to achieve recognized standards for Operational Sustainability. These decisions will define fundamental organization structure and determine what functions will be provided by contractors and which will be performed by in-house staff. Creating this up-front structure and definition will eliminate wasted effort in the planning stages since contracts (internal and external) can be developed and managed appropriately from the start. Going through this process will force the team to make most of the essential decisions and lay the foundation for a successful maintenance and operations program. This exercise will generate a detailed responsibility matrix that provides clarity and drives organizational efficiencies. During design review, the Operations team must conduct a thorough failure analysis and maintenance analysis. According to Uptime Institute’s standards, Tier IV Certified data centers are designed to detect, isolate, and contain failures. All other Tier objective data centers should conduct failure analysis as an important planning factor. Organizations must plan for consequence management in the event of a failure that leads to loss of redundancy and not an outage. A thorough failure analysis allows the data center to effectively prioritize emergency response procedures and training and may lead to design modification if the cost is justified. Maintenance analysis determines not only if the facility can be maintained as designed, but also at what cost. The total cost of ownership of a data center can increase dramatically if the design fails to accommodate the most effective maintenance practices. Once these analysis efforts are complete, and the results incorporated in the design, planning begins. Next, the Operations team must develop operating standards based on site mission, reliability and availability requirements, and industry best practices. Establish supporting contracts with vendors, put subcontracts out to bid, and define staffing plans based on the requirements that were decided on in the strategy phase. Defining shifts and staff qualifications affords the talent acquisition team time to secure the best possible personnel resources. If the organization chooses to acquire an automated maintenance management system, this is the time to make that acquisition. The information that will be flowing in all subsequent phases should be entered into the system in preparation for the production environment. It is critical at this point to define the processes the organization will use to record and access the key information that is needed to maintain the environment. Whether in the presence or absence of an automated system, success depends on thoughtfully engineered procedures. The construction phase is more than just time to build. The infrastructure design is complete, and the management and operations plan is in place. The general contractor now focuses on building to meet the design specifications while the Operations team focuses on building the program as planned to meet the uptime requirements. Both teams are going to be very busy and must put all the key components in place so that they are ready for commissioning. Also during this time, emergency operating procedures should be written and the training program defined. The goal is to train the staff to perform each critical function on Day One, so it will need to run through emergency response drills during commissioning. The MMS and documentation libraries need to be populated and version control procedures need to be employed to ensure accuracy. All documents, site work rules, and key procedures should be defined and documented with sign-off by all stakeholders. It is critical to have change management procedures in place to ensure coordination between the construction team and the Operations team. Frequently, data centers are built with some variance from the construction documents. Some of these changes are beneficial and some are not, so any deviations must be reviewed by Operations. The commissioning phase is the best time to test the critical infrastructure, test the critical operations procedures (EOPs, SOPs, and MOPs), and train the Operations staff. Safety is the first priority; staff should be thoroughly trained on how to operate within the environment and know how to respond to any incident. All members of the team should know how to properly use the systems that have been implemented to accurately store and process operations data. While in a non-production environment, operating procedures can be tested and retested and used as a means of training and drilling staff. The goal is to mature the team to the point that reacting to an incident is second nature. Exercising the entire staff in the most likely events scenarios is a good way to develop proficiency in taking systems on- and off-line without any risk to personal safety or system integrity. Having the Operations team perform some of the commissioning activities as further training is becoming a more common industry practice. The construction project has reached substantial completion. The result of working through an integrated design-build project approach is that the Operations team is now trained and ready to assume responsibility for the ongoing operations of the data center. The organization can deploy technology without risk and meet or exceed service levels from Day One as a result of the careful planning, development, training, and testing of the operations management program. However, even though the operations program is ready just as construction is substantially complete, there is still more work to be done. The construction team has a punch list and the Operations team does too. The first year of operations will require the completion of standard operating procedures and methods for routine maintenance. Up to this point, the focus of building the program was training staff to operate and react to incidents. Now the focus will be on establishing a tempo and optimizing day-to-day procedures between various stakeholders. The data center environment is never static; continuous review of performance metrics and vigilant attention to changing operating conditions is critical. Procedures may need to be refined or redefined, training refreshed, and systems fine-tuned with a continuous quality improvement mindset. However well designed a data center appears on paper, ultimately its success stands or falls on day-to-day operations over the lifespan of the facility. Successful operations over the long term begins with having—at every stage of the planning and development process—an Operations advocate who deeply understands the integrated mesh of systems, technology, and human activity in a data center. By starting with the end in mind and giving Operations a strong voice from the outset, organizations will reap the benefits of maximum uptime, efficiency, and cost effectiveness year after year. The video below features author Lee Kirby, along with Google’s Vice President of Data Centers, Joe Kava, discussing how to start with the end in mind by involving data center operations teams starting with the design phase. Lee Kirby is Uptime Institute’s CTO. In his role, he is responsible for serving Uptime Institute clients throughout the life cycle of the data center from design through operations. Mr. Kirby’s experience includes senior executive positions at Skanska, Lee Technologies and Exodus Communications. Prior to joining the Uptime Institute, he was CEO and founder of Salute Inc. He has more than 30 years of experience in all aspects of information systems, strategic business development, finance, planning, human resources and administration both in the private and public sectors. Mr. Kirby has successfully led several technology startups and turn-arounds as well as built and run world-class global operations. In addition to an MBA from University of Washington and further studies at Henley School of Business in London and Stanford University, Mr. Kirby holds professional certifications in management and security (ITIL v3 Expert, Lean Six Sigma, CCO). In addition to his many years as a successful technology industry leader, he masterfully balanced a successful military career over 36 years (Ret. Colonel) and continues to serve as an advisor to many veteran support organizations. 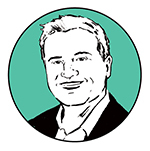 Mr. Kirby also has extensive experience working cooperatively with leading organizations across many Industries, including Morgan Stanley, Citibank, Digital Realty, Microsoft, Cisco and BP.